Audi's Martin Tomczyk, driving a year-old A4 DTM, is now the DTM series leader following a huge win at the Lausitzring. 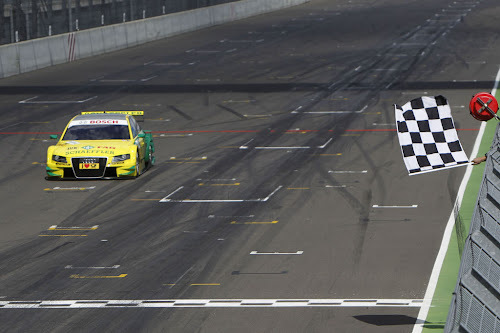 Sunday's race marked not only Tomczyk's second-straight win of the season but also Audi's third consecutive DTM win this year and the first four-ringed victory at the Lausitzring since 2005. 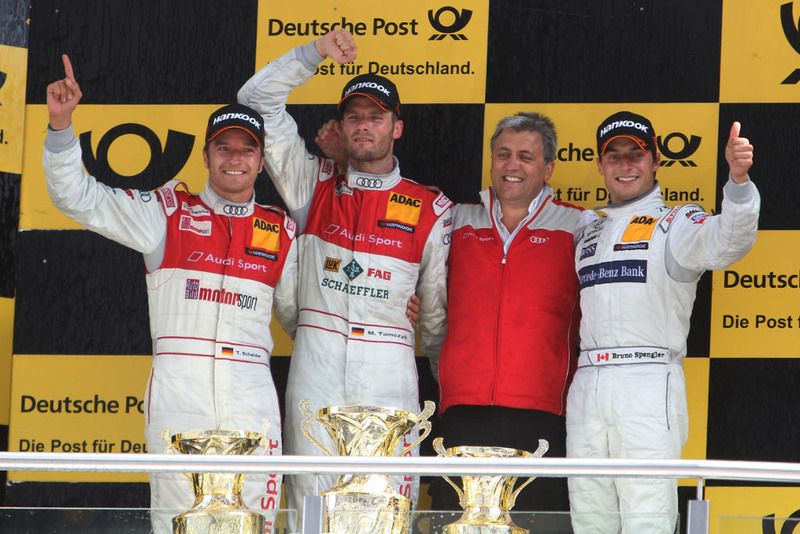 Joining Tomczyk on the podium in second place was Timo Scheider, securing a 1-2 Audi victory. Full report and photos after the jump. 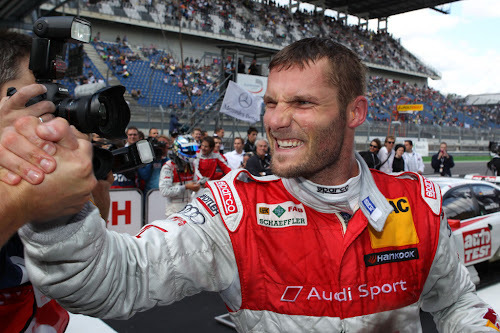 Ingolstadt/Klettwitz, June 19, 2011 – By clinching his second consecutive victory Martin Tomczyk (Audi Sport Team Phoenix) has taken the lead in the overall classification of the DTM and secured the first Audi success at the Lausitzring since 2005. 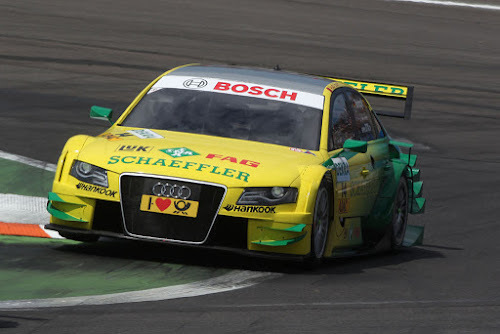 Timo Scheider (Audi Sport Team Abt Sportsline) perfected the great triumph of the Audi A4 DTM by finishing as the runner-up. As early as at the start Tomczyk, who had started from position four, improved by one position and immediately put pressure on the two leading Mercedes drivers, Bruno Spengler and Jamie Green. On lap three he passed Jamie Green under braking at the end of the start-finish straight. By making a delayed first pit stop the Audi racer on lap 16 overtook Bruno Spengler as well. From then on he was able to easily enlarge the gap between himself and the front of the field and at times extended his lead to more than ten seconds. "My A4 was fantastic again today, incredibly quick and extremely easy to drive,” said a jubilant Tomzcyk after his second consecutive win. "I love my car; it is huge fun to drive it – and the team again did a perfect job today. 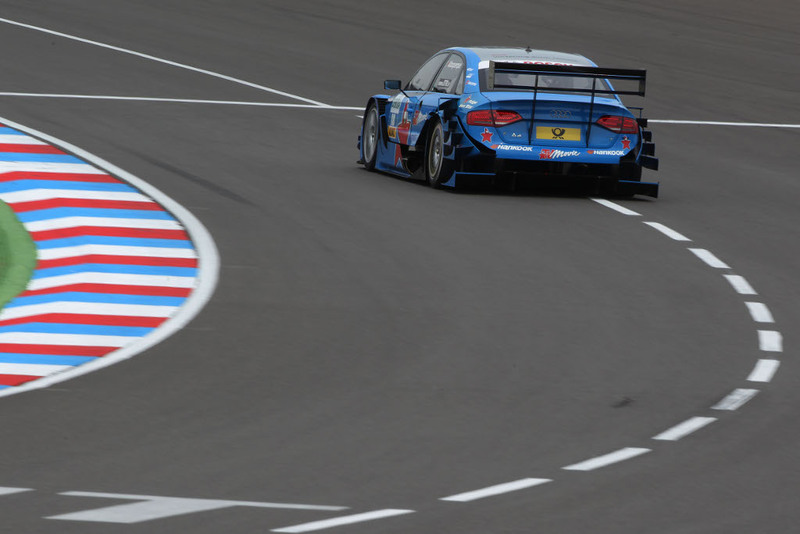 It’s a great feeling to be leading the DTM with a year-old car.” With 30 points to his credit Tomczyk is now leading the standings one point ahead of Bruno Spengler. Timo Scheider improved to third place in the overall series standings. 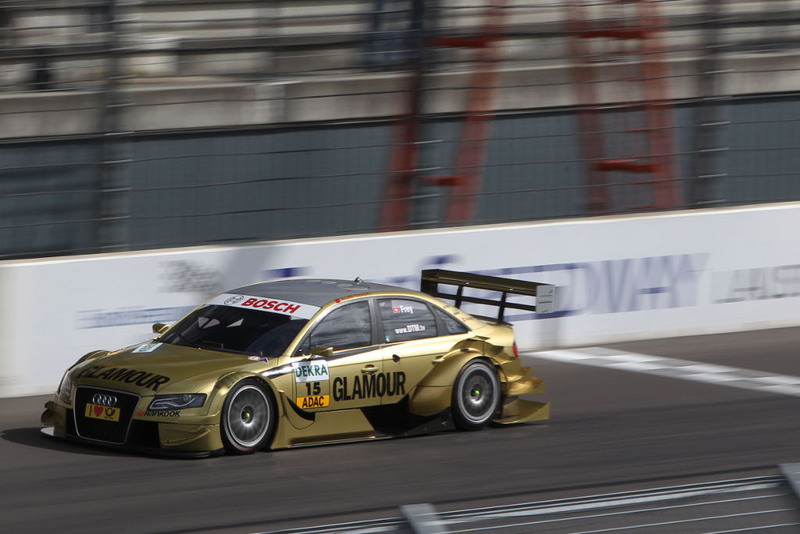 From position nine on the grid the two-time DTM champion managed an impressive recovery that allowed him to advance to second place. Scheider came in for his two pit stops extremely late and thanks to this strategy plus an extremely fast car was able to outrun the Mercedes-drivers Bruno Spengler, Jamie Green and Gary Paffett who had started in front of him. With Oliver Jarvis, Tom Kristensen and Filipe Albuquerque clinching points a total of five Audi drivers scored at the Lausitzring. Oliver Jarvis fought captivating duels with Jamie Green and Gary Paffett. 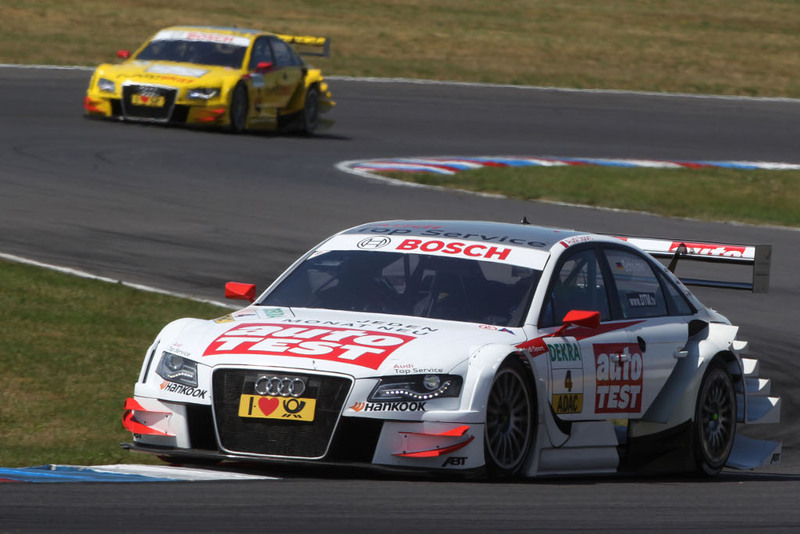 Tom Kristensen took two points on his DTM comeback. Filipe Albuquerque (Audi Sport Team Rosberg) in eighth place was the best DTM rookie and achieved the first point in his still young DTM career. For Mattias Ekström the race was disappointing. 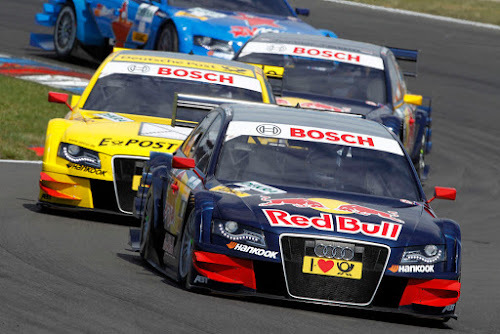 The 2005 Lausitzring winner lost a lot of ground in the early phase due to handling problems and in the end had to settle for eleventh place. 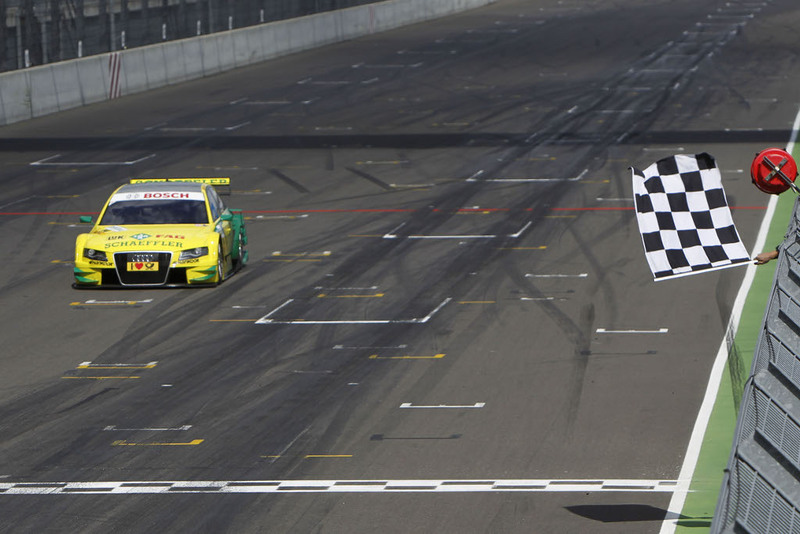 Rahel Frey again saw the checkered flag in her fourth DTM race. Miguel Molina was running in the points in sixth place when he was forced to retire due to a transmission problem. Edoardo Mortara had to park his A4 after several incidents of body contact with suspension damage. 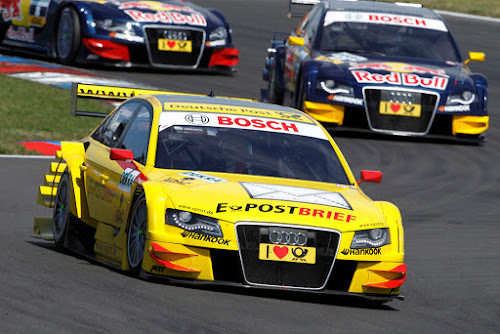 Just 14 days from now the next DTM race is on the agenda – at the Norisring in Nuremberg where Audi has never scored a victory since its return to the series as a manufacturer. 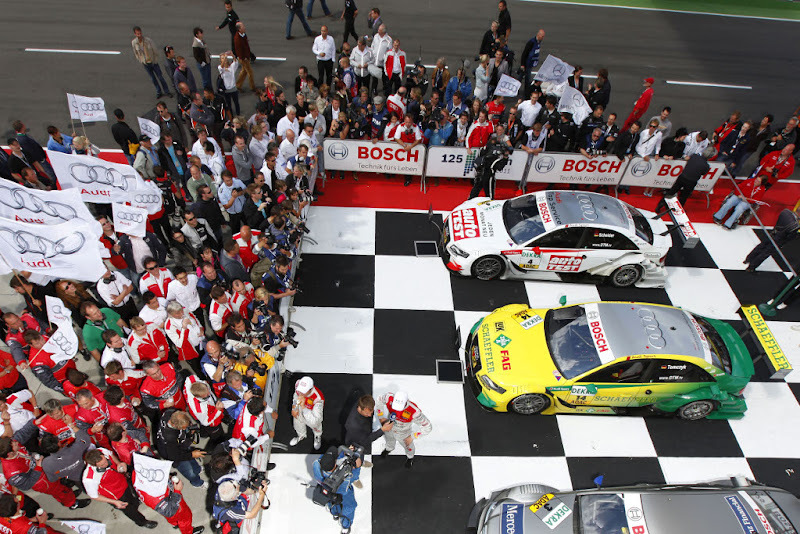 After the triumph at the Lausitzring the home victory is Audi Sport’s next big declared aim.